The luxury car is expected to have upgraded interior and exterior features. Volkswagen Beetle features includes acoustic rear parking sensors, cruise control and rain sensors. The interiors is in dual tone finish. Volkswagee Beetle is blessed with six-speaker stereo and indash CD player which is capable to read via the MP3 format. The car has most advanced dashboard in dual tone with stunning graphics. The luxury car also boasts of climate control air conditioning system, heater and AC vents that jointly promise great riding experience. The tilt steering wheel has leather covering and mounted audio controls. 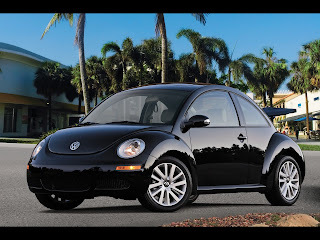 The initial Volkswagen Beetle pictures suggests that it will have body colored door handles, a roof mounted antenna, metallic paint, black front grille, two speed wind shield wipers and body colored mirror housings. In addition to this, the car might house Daytime Running Lights (DRL), Anti-intrusion side door beams, Tinted glass, green, Anti-Corrosion Fully galvanized sheet metal etc. Volkswagen Beetle price is believed to be around Rs 22 lakh in India on account of import duty as it will be a completely built unit from Mexico. According to company officials, the mini luxury car will attract 110 per cent import duty. Thus it will be four times costly than Volkswagen Polo. The officials informed that the car will be assembled at VW's Pune facility.